Thank you for your support of MOVE. I launched it two years ago in New York City with an exciting store front display on 5th Ave. Wow, I was so grateful for that experience! I’m also very grateful to report that after 2 years sales are still steady. Thank you all. But what is it specifically that people are responding to? It’s a real delight as an author to be able to go to my kindle and see what the most highlighted passages in my books are. 1. Your job as a leader is not to make the best of the team you have, but to build the team you need. 2. Simply telling people what is important will not cause the organization to start doing what is important. 3. As a leader you need to demonstrate your commitment to the transformation with every decision that you make every single day. 5. Your strategy is not what you say it is. Your strategy is where you put your resources. You can say whatever you want about what your strategy is, but if you want to know what your strategy actually is, just look at your budget. Recently, I had a real treat when I walked into the Amazon book store at Santana Row in Silicon Valley and right inside the front door looked up and saw MOVE face out. 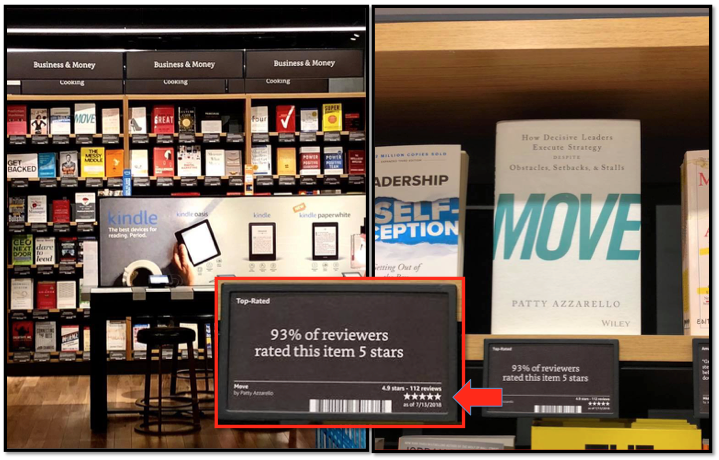 And it was also one of only five in this display of 90 business books that had a special little sign for books that have more than 90% five star reviews. I’m so very honored. Thank you again. Reviews are the life blood of authors. So to mark and celebrate MOVE’s two year anniversary, I wanted to see if we could get a bunch more reviews on Amazon. So if you have read MOVE and have not yet left a review, I would appreciate it very much if you could take just a minute or two to write one. Thank you again for all the interest and support of MOVE. As I’ve worked with clients, it has been very gratifying to see the principals and practical ideas in MOVE come to life in businesses across the world. I am available to speak at your company, annual meeting, or customer event. I can also deliver a custom workshop on Leadership or Strategy Execution for your leadership team. And I always include copies of MOVE in my engagements. Contact Me if you’d like to talk about it.